I don’t have much to say this week, except that I fulfilled my craving for coffee cake. More specifically, I fulfilled my craving for a crumb topping. I was watching the Food Network, as I usually do all day, every single day. I don’t remember what show I was watching exactly, but they were making something involving a crumb topping. As soon as I heard “crumb,” my ears perked up; only focusing on the fact that chunky bits butter, sugar and flour were on the horizon. Let’s be real for a sec, anything that involves a special kind of topping, be it a crumb or a crust, is a fantastic dessert. Since I already did (and failed miserably) a oat streusel topped dessert, I went after the crumb. 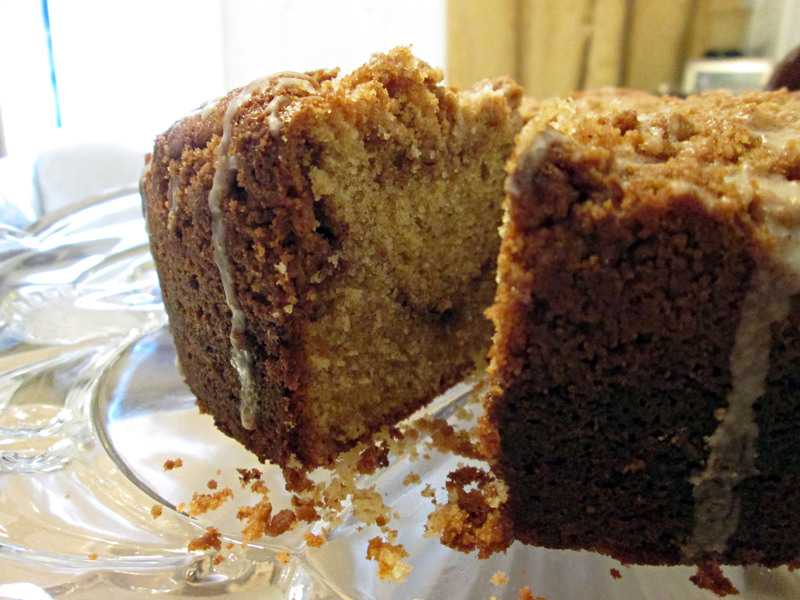 Coffee cake is one of the easiest and simplest cakes out there. Most, if not all, are sour cream based. 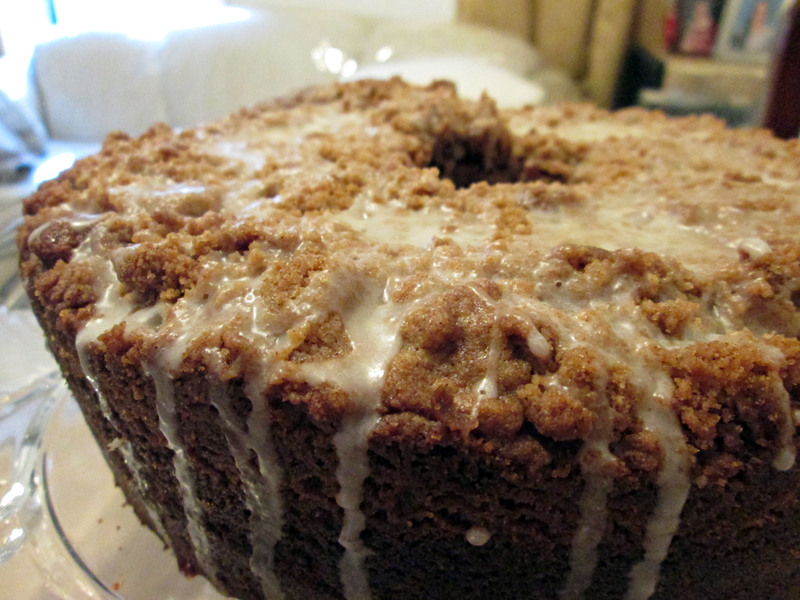 Believe it or not, that’s the best part about a coffee cake (not counting the crumb topping). The sour cream not only adds necessary moisture to the batter, but it helps give the cake a dense but tender crumb. Not to mention it also makes the cake bright and tangy. It’s weird, but trust me it is good. Sour cream isn’t only found in coffee cakes, though. It also goes extremely well in pound and chocolate cakes. Let’s talk topping for a second. Crumb streusel is made up of mostly cold chunks of butter cut into, sugar, spices (sometimes) and a little bit of flour. In the oven, the sandy mixture conforms together into a crunchy, lumpy mass that creates chunky crumbs when pierced. Just the thought of crumbling crumbs was enough motivation to make this cake! Now, this specific recipe makes A LOT of crumb topping. I was honestly overwhelmed with the amount the recipe asked for, and almost cut it in half but I didn’t. Trust the recipe; it may seem like a lot but it is enough. This was my first time using sour cream in a cake, and it certainly won’t be my last. It made the cake slightly tangy, which went perfect with the super sweet and crunchy crumb topping. The middle layer of sugar and cinnamon was a nice surprise, reminiscent of the insides of a cinnamon roll. 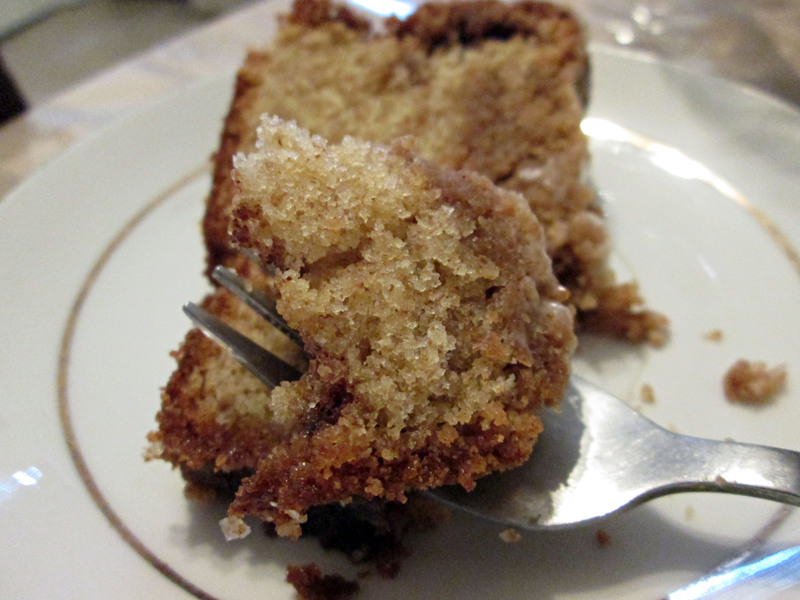 The thick and brittle crumb topping was the best contrast against this dense and tender cake. Its sweet and salty taste evened out the cake’s tanginess, making it a perfect marriage of differing tastes and textures. It is the absolutely perfect companion to a cup of steaming hot coffee. Make the streusel topping: Mix together flours, 3/4 cup brown sugar, 1 teaspoon cinnamon, and 1 teaspoon salt. Cut in butter using a pastry cutter or rub in with your fingers until small to medium clumps form. Refrigerate until ready to use. Make the streusel center: Mix together remaining 1/4 cup brown sugar, and 1/4 teaspoon cinnamon. Preheat oven to 350 degrees. Make the cake: Butter a 9 or 10-inch tube pan with a removable bottom. Sift flours, baking powder, baking soda, and 1/2 teaspoon salt into a bowl. Cream butter and granulated sugar with a mixer on medium speed until pale and fluffy, about 2 minutes. Beat in eggs, 1 at a time, then vanilla. Beat in flour mixture in 3 additions, alternating with sour cream, beginning and ending with flour. Continue to beat until well combined. Spoon half the batter into pan. Sprinkle streusel center mixture evenly over batter. Top with remaining batter, and spread evenly using an offset spatula. Sprinkle streusel topping mixture evenly over batter. Bake until cake is golden brown and a toothpick inserted into the center comes out clean, about 55 minutes. Transfer pan to a wire rack, and let cool in the pan completely. Remove cake from pan, and transfer to parchment. Make the glaze: Mix together confectioners’ sugar and milk. Drizzle over cake, and let drip down sides. Let set for 5 minutes before serving.